A solid website is your round-the-clock online representation. At least for as long, as your target audience can see it. Building a new site from scratch can be pretty costly for both organizations and individuals. Luckily for them, choosing a domain name will hardly empty your wallet considering some easy steps to get it for free. Getting a domain name from Wix for free. How to get a free domain from Bluehost. Let’s have a closer look at all the above-mentioned paths to sort out the best-matching variant to fit any budget or need. Opting for a website builder would be a wise decision for those who do not have an existing online project and want to build a website from scratch. It is a perfect option for starters with no technical skills or coding knowledge. Website building technologies offer all tools you might need in the pack including a free domain name. All you need is to choose a plan that already contains the feature. Wix seems to be the best option from this point of view. It has plenty of plans to choose from. It is affordable enough and lets you create a professional website from scratch without any skills. Moreover, users can take advantage of some extra perks that will put ease o the wallet. Great for Newbies – a good solution for non-technicians who do not want to deal with a complicated process of domain registration or website building. The system will handle all major tasks for you. Simply choose a plan, pay for a year in advance, and start creating a brand-new project using any of the available templates. Affordability – Wix comes as a real bargain with plans for any budget. It will hardly be a challenge for the wallet no matter what type of website you need. You will get a set of building tools in addition to a free domain name for only several bucks a month. Flexibility – You can choose from an array of different plans with features to meet your website needs. Whether you are about to launch a professional blog, portfolio, landing page, small business website or a digital shop, Wix offer plans to meet your expectations. Wix Unlimited Plan is a good pick for those who want to launch a website without thinking back of limitations. Costing $12.50 per month, it includes a Free domain name in addition to 10GB of storage, SSL certificate, premium customer support and $100 for your Google and Bing ad campaigns. The plan is good for different types of websites such as blogs, small business websites, professional portfolios or more complex projects. Users can benefit from special offers and discounts provided by Wix. You can get all featured with Unlimited Plan for only $6.25 thanks to 50% discount. A good news for those seeking cheaper opportunities. Affordable Plans starting from $6.25 per month. Pay for a year and forget about any technical issue. Discounts and Special Offers. Wix usually provides its customers with coupons and promo codes that guarantee discounts up to 50% on yearly subscriptions. No domain registration procedure. All you need is to sign up, choose a plan, pick a domain name and start building a website. 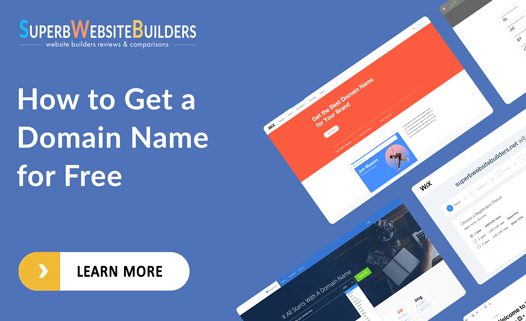 Verdict: opting for a website builder as a free domain name provider is a good option for newbies as well as those who still do not have a website and are about to launch a brand-new web project. A hosting platform is another guaranteed way to get a free domain. Whether you already have a domain and want to link it to a new website or you want to create a new project, hosting providers appear to be a safe way to host your site at affordable prices. The main difference between website builders is the fact that hosting solutions still require some hands-on approach. In other words, you are supposed to have at least some basic knowledge to complete the registration process in addition to CMS installation. On the other hand, a hosting company is the best bet for WordPress websites and projects powered by other popular CMS platforms. At the same time, choosing a proper server solution requires taking into account some vital features like performance, security, uptime, etc. to ensure smooth site running despite the traffic spikes and the amount of content. From this point of view, BlueHost looks like the best option providing a set of great features in addition to multiple hosting options, WP features, and more. Additional features like SSL, email accounts, etc. For SuperbWebsiteBuilders readers the Bluehost Basic Plan starts at only $2.95. For this price, you get a free domain name in addition to unlimited bandwidth, 50GB of storage, WordPress updates and more. Plus and Choice Plus Plans will cost you from $5.45 with a bunch of essential and advanced features including domain privacy, anti-spam tools, and more. Wide Selection of Hosting Solutions. Users can choose from shared, dedicated or cloud hosting solutions for any website despite the complexity or type. Affordability. You get a pack of great features in addition to a free domain for less than $2.95 per month. WP Support and Upgrades. Bluehost is a perfect solution for WordPress-based website with tons of plugins, add-ons, upgrades to choose from. Cons: Not for Newbies. You are supposed to have at least some fundamental user’s experience when it comes to fine-tuning the website. Verdict: A hosting provider seems to be the most flexible and affordable option. Users are not linked to a single platform thanks to site migration options. Moreover, they can easily switch between different plans whenever extended hosting capabilities are needed. Free domain registration services like dot.tk only look like a great option. 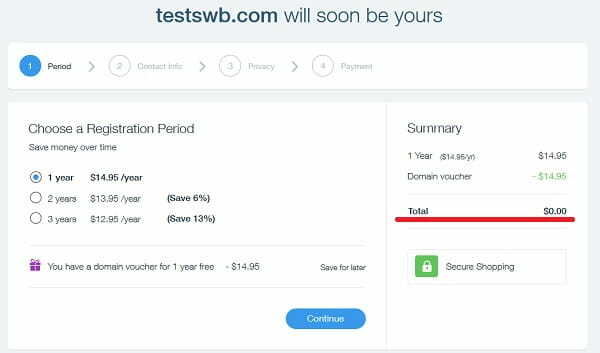 Despite the fact they offer an opportunity to register a domain name for free from a year to an unlimited period, they only offer such zones as .ga, .gq, etc. They are hardly the best option if you want to promote your website in future to get higher search engine ranking. It will be wiser of website owners to pay a minimum fee for a .com domain name. On the one hand, your site will look more professional and trusted by the potential visitors. At the same time, do not forget that you will still need a website building tool or CMS platform to launch the project, which will result in extra costs. It is better to have everything in one place instead, isn’t it? Pros: Good only for temporary domain names and websites. Domains for those, who are not really concerned about their site appearance and promotion. Bad for long-lasting web projects. Verdict: the option is hardly a good decision in case you really want to build a solid website. Free registration services look inefficient, as you still have to choose a website builder or a hosting. Both offer free domain names. So, free registration services have no sense from any point of view, unless you look for a daunting and challenging way to launch your site. Summing up, Wix website builder or BlueHost hosting looks like the best way to get a free domain name in addition to multiple features. They will ensure smooth running as well as further promotion capabilities. Free domain registration tools are nothing but a waste of time. There is no point in them, as you can get an all-in-one website building package instead for only several bucks per month with a full set of tools for both newbies and professionals with at least basic technical skills.